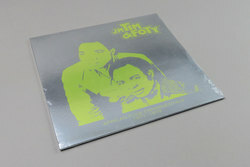 J. M. Tim And Foty - African Funk Experimentals (1977-1979). Vinyl LP. Bleep. Amazing vocal harmonies from this duo of Cameroonian cousins. Deep afro jazz, dance floor burning late night grooves and funk sensibilities all combine to make this new Africa Seven issue a real winner. Although the highlight is undoubtedly the loft disco era, Missy Elliot sampled ‘Douala By Night’ the rest of this compilation still comes highly recommended. Choosing to focus on just two years (’77 to ’79), the guys behind AS excel in their choices, ‘More and More’ perhaps providing the records second best jazz/discoid moment. Plus excellent deep modern soul on ‘Love is Light’!